There is a chest cold leaping from kid to kid in my house, which sounds super unpleasant now that I write it down, but that’s only because it is. Truth in advertising, y’all. Ten days (per kid!) of fever-plus-coughing-plus-misery times six kids equals I don’t even know what. By week three of Kid-Sick-Capades (like IceCapades, but without the flashy costumes), when a friend called to ask how I was doing, all I could think to say was: I feel like I am underwater. Oh no! she said. That sounds bad. That sounds like drowning. Well, yes. Yes it does. Underwater does sound like drowning, like thrashing and flailing with no way to rest or to breathe. We’ve all been there. But that wasn’t what I was feeling. I meant that all the things—the caretaking and the keeping-the-house-from-falling-down-around-our-ears and the things-being-due and the email and all the usual stuff—had built up like a giant wave, and my options were get crushed or get out of the way. I was thinking of the ocean. I was thinking of what you do when a wave is coming at you. Sometimes instead of trying to ride that wave or trying to bob over the top of it, you duck down and swim underneath. Up above, there’s crashing and noise; underneath, everything is a little slower, calmer. Muted. It’s a way of letting go of the surface things. It’s hunkering down. Underwater is softer than being up in the spray and the wind. It’s steadier than being pushed around by the everyday waves. The daily routine, all the things I keep on top of—those are the waves, coming in and going out. The other stuff that I don’t even know to watch for—the conflicts that need resolving, the dishwasher that stops working, the decisions that need to be made, the news that needs a response—that is the slap of salt water splashing in your eyes. But under the water, there is none of that. There’s only filtered light and sand and maybe seaweed, waving politely. The critical things—taking care of sick kids, warming up last night’s soup for tonight’s dinner—those things are still with you, wherever you go. Underwater, though, you let go of everything else. You let go of everything that can possibly wait. Your brain moves a little slower. Your body moves a little slower. You consider trying to sneak in a nap, somehow. A nap is the opposite of battling the waves. You can’t stay down there, of course. You can’t hold your breath forever. If you stay there too long, you really will drown. And anyway, up above, there’s sun and light, and fresh air, and warmth. Up above, you can navigate. Things are always changing up there, and you can change direction, too. So you just stay under until the wave passes, until the storm moves along. And when you go up, you discover that maybe some of the things you let go of didn’t matter in the first place. And not only that, but you get a fresh glimpse of your own smallness. The wave was bigger than you, and the world is even bigger, and it kept working and existing and turning even when you weren’t looking. Smallness is not so bad. You are small, the wave was bigger—but you endured. The wave didn’t take you out. So I wasn’t drowning, I just wasn’t riding the waves, either. I was out of sight. I was letting some stuff pass me by. The kids got better, eventually, mostly. I did return text messages, finally. I did shop for real groceries and return library books and make dinner and wash a million pajamas and do all the things that make up a day again. My hands and feet and thoughts all returned to normal speed. That’s what I remind myself when I’m under water: This wave will pass, and when it does, you will stand back up. You won’t be underwater anymore. You may be stronger or you may be more tired, I don’t know. 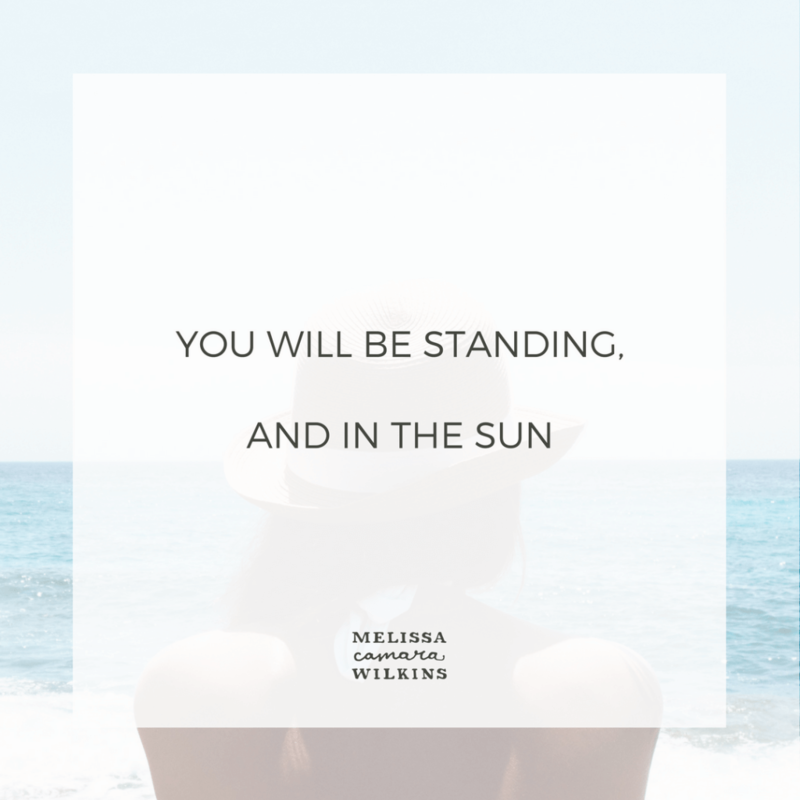 But I know you will be standing, and in the sun.